This rather excellent book has such a neat twist at the end! 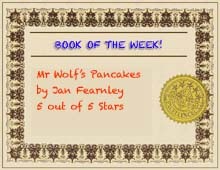 Mr Wolf is a hungry little chap, not too bright but when he tries to enlist the help of his rather nasty neighbours (cameos from other popular nursery rhymes and fairy tales), Mr Wolf perseveres in his quest to make a stack of pancakes. Jan Fearnley performs a neat trick here. First she makes the reader feel a fair amount of sympathy for poor Mr Wolf as he tries to work out what ingredients he needs, how to write out a shopping list and finally how to work out how much everything costs. Every time he asks for help, his neighbours rather rudely slam the door in his face. Poor Mr Wolf. Readers might sense a touch of "Henny Penny" in the story but ah, Fearnley's next trick is to turn the story on its head. 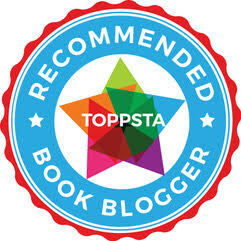 And of course, in true reviewer style I won't spoil the end but it made me laugh and made Charlotte laugh too. Little Princess: I Want to Play! Here at ReadItDaddy, it never ceases to amaze me just how children take technology in their stride. A tiny box that speaks, plays video or music is not magical in any way, in fact we've had experiences where Charlotte has actually looked for the 'on' switch on toys that were never designed to make any sort of electronic bleeping noise, or lull her to sleep with a song or two. Naturally, when she sees me using my favourite iOS device, she wants to have a go - and thankfully there are a raft of kid-friendls iPhone apps out there for children to play with (I'm not quite nutty enough to buy an iPhone btw, I drew the line at an iPod touch). In the first of an occasional series, we'll be taking a look at apps aimed at children. As we were given the opportunity to review the new "Little Princess: I Want to Play" app, we thought we'd christen "Play it daddy!" with it. Developed by Jick Jack, the Little Princess app is actually four minigames in one. Fans of Tony Ross's superb books, and of course the Channel 5 / TV LoonLand Animated series will instantly know who the Little Princess is. She's a rather mischievous little royal madam, and gets up to all sorts of pranks and mishaps during the course of her interesting little life. The app has been designed to appeal to younger children, and my fidgety three year old impatiently waited for the introduction scene to finish before diving straight into the first of the minigames, "Dressing Up". Here you're given the opportunity to drag and drop clothes onto the Little Princess. Everything from a pirate hat and eyepatch, to some swimming togs and even a nurse's outfit. Charlotte struggled at first with the drag-and-drop mechanism for this minigame. It is a bit fiddly, and the arrows for scrolling through the selection of clothes for head, body, accessories and feet could've been larger. Some tweaking is needed with the selection and dragging of clothes too, as it's all too easy to accidentally remove an item you've just lovingly placed. Though Charlotte said this was her favourite of the four games on offer, it was also the one she found most frustrating. From a parental point of view, the selection of clothes on offer for The Little Princess is in keeping with the show and the books, but is really on the stingy side. There could've been a lot more to choose from and also a little more care in the presentation, more sound effects perhaps? It all felt a bit too...quiet. It's a nice touch to allow children to take pics of their favourite Princess outfit and these are stored under your photos folder. Watch out for this though, you can very quickly end up with a device full of princess pics! Moving on we next took a look at bath time. Here you're given the opportunity to bath the Little Princess' two prized pets, Scruff the pooch and Puss the cat. The 'gameplay' is essentially the same in both cases - a test to see how quickly you can soap up the hapless puss or pup, covering all their muddy bits, before popping all the soap bubbles that cover the screen afterwards. Charlotte had a lot of fun with this and though it's extremely simple, she had a good few goes at it before wanting to move on. Lastly we tried the Pairs game. A simple selection of cards is laid out on screen, face down and the player must match the pairs of Little Princess characters to clear the game. Of the four games on offer, this was the one Charlotte spent the most time on (being fairly familiar with 'pairs' from a real set of cards she sometimes plays with). Great controls, easy to pick up and with some spot effects to make things a little more interesting, Pairs was nicely done. Taking a look at the app overall, the presentation was OK but could've done with a truckload more Little Princess assets in it. For the price (£1.99 is fairly steep for something this shallow when you consider that some of the best iPhone apps and games are 69p) the developers could've done a lot more to make it feel like good value for money rather than something a parent would probably buy simply because of the links with the programme and the hope that it will keep their little one quiet for a while (but then again you could level the same criticism at virtually any kid app on the iTunes store). Visuals are in keeping with the books and TV show, so they're instantly identifiable to little fans. The app probably works far better on the bigger screen of the iPad rather than the iPhone / iPod Touch screen, so perhaps the few niggles about the size of controls wouldn't be an issue for iPadders who are nutty enough to trust their youngsters with such a prized piece of kit. Many thanks to Fiona Williams from Just Williams PR for the opportunity to review the app. Like most classic children's fairy tales, Goldilocks and the Three Bears has been told and retold by countless children's authors, and re-drawn in many different styles by countless children's illustrators. Taking on both roles, Gennady Spirin definitely has a differerent approach with painted illustrations that look like classic renaissance paintings. Of course, the story is pretty much the same. The three bears get out of their beds, make porridge, sit on their chairs, decide their porridge is too hot and go for a walk. What happens next? A rather naughty girl called Goldilocks happens next, and the eerie depiction of the troublesome golden-tressed mischief maker is quite odd in this book, but because of Spirin's deft touch at depicting human expression (which also gets transferred across to the bear characters in the story too, spookily! ), children can more readily identify with this version of Goldilocks rather than a more basic depiction. Daddy's favourite bit - Spirin's luxurious illustrations. Almost good enough to hang on the wall. More Mr Bloom coming soon, boom boom! 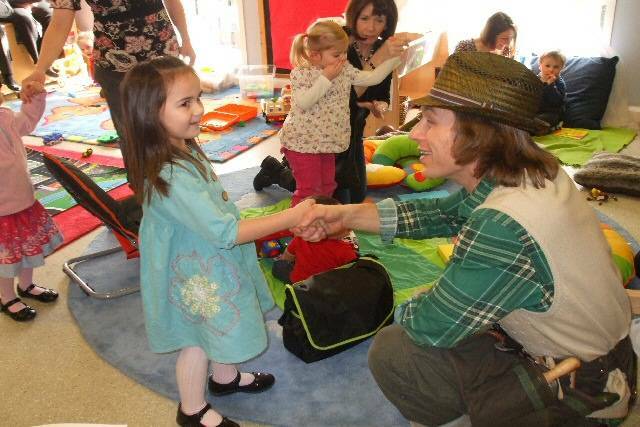 The first series of CBeebies show "Mr Bloom's Nursery" was a big hit with Charlotte, with its mixture of vegetable characters, insanely catchy songs (try getting the theme tune out of your head once it's in there!) and of course the rather personable Mr Bloom himself, wonderfully played by the series creator Ben Faulkner. Despite the original location and plot being 'recycled', the new show is now filming in various locations with new surprises in store for young viewers. A new veggie joins the usual gang of Joan, Margaret, Sebastian, Raymond and of course everyone's favourite bean Colin. Compo (the composter) has also had a makeover so he'll be able to do a bit more and wow the kids. The series kicks off with a few special episodes, set to air over the long summer holiday. If your children are still avidly watching the re-runs, news of a second series is certainly going to be welcome. Most toddlers have a favourite toy that they refuse to be separated from. My nephew is on his third (or is it fourth) Joe Jingles (though I think it's only the third or fourth because of some sneaky midnight swapping by his parents, and spun stories about Joe being 'reborn' every once in a while because the old one gets so manky!) Charlotte's current favourite is a singing unicorn (yes, it really sings, and if you've any experience with 'singing' toys, singing is a very loose description of what goes on). The wee lass in this book is hopelessly and completely in love with her Knuffle Bunny (that's ker-nuffle, not Nuffle) and proudly takes it with her on her first day at school. Sadly, she soon realises that it's not as unique as she thought. Her evil nemesis at school, the terrible Sonja, also has a Knuffle Bunny (that's Nuffle, not Ker-nuffle) and after arguments and a mix up, the wrong bunny goes home with the wrong girl. An amusing tale, with rather neat artwork (a mixture of bold drawn characters and surroundings mixed with photo montages), and a happy ending. It's not often you get to praise a book for having pitch-perfect rhyming text, wonderful illustrations and a superb 'message' at the end of the book (which both adults, and given my recent experiences while on kid's days out, children will identify wholly with). "Hello, is that Grandma?" has all of these and has ended up being one of Charlotte's firm favourites. Though this is a 'lift the flap' book it's more appealing to preschool toddlers than younger kids. Each 'reveal' introduces a new animal character or crazy antic, which helps the story bounce along with the rhyming text. If your toddlers are anything like ours, they've already mastered the phone (and probably sneakily pinch your mobile for a bit of play acting from time to time) so this is definitely going to be a winner. And to all those parents I see glued to their Blackberries, or their iPhones while they're listlessly wandering around at children's theme parks, farm parks or other activities - do what the mummy at the end of this book does and be thoroughly ashamed of yourselves! Charlotte's best bit: The crocodile. You see, once again children love the baddies! After enjoying the recent "Alice Weekend" here in Oxford, I have been on the lookout for a 'toddler' version of Lewis Carroll's classic children's book for quite some time. We finally spotted one and though it features some absolutely beautiful illustrations by Mauro Evangelista, the abridged text is far too choppy and disjointed to really give a flavour of the original book. Carroll's nonsensical tale gets butchered, to put it plainly - to the point where even a forgiving child's imagination struggles to fill in the gaps. It's not an enviable task to take a well loved (and lengthy) work and make it appeal to a younger audience. I guess I'll just have to wait until I can show Charlotte the 'proper' version instead. A pity. What caused the Dinosaurs to die out? A massive meteorite? The Ice Age? Hacking scandals? No it was underpants, as every child knows - particularly after they've read the latest in the 'Underpants' books from Claire Freedman and Ben Cort. The team have successfully given us instant classic 'Aliens Love Underpans' and 'Santa Loves Underpants', now they turn their focus on the stone age and the most important invention since the wheel, the Y Front. Dinosaurs covet mankind's invention, and lots of squabbling ensues. This delicious rhyming tale is a must for any dino-obsessed child, helpfully taking them through a few well known Dino species before their pants-based demise. Bouncy fidgety storytelling at its best. Toddlers will love it to pieces. Daddy's favourite bit: The Triceratops, of course. Oh dear, oh my! Once again the "No monster books!" rule has been swept aside, and letting Charlotte choose her own books from the library stacks has resulted in another monstrous tale being added to our weekly haul. "I'm coming to get you!" by Tony "Little Princess" Ross is an ages-old tale respun with superb illustrations by a master of children's literature. The title sounds scary, the nasty monster on the cover is quite scary for youngsters - even his nefarious actions are fairly scary as he devours worlds, crushes civilisations and finally fixes his evil stare on a poor lad called Tommy on the twinkling blue planet of Earth. Charlotte's best bit: Monster crushing the poor defenceless Banana People. Remember the Incredible Book Eating Boy? He's not the only character who likes a nibble on a leaf or two from a classic tome - here's Winston the Book Wolf. Banned from his local library, chased by evil librarians and shunned by security guards, poor Winston finds a friend and discovers that books taste even better when read with the eyes. Winston's girl friday soon hits on a plan to get Winston back into the library, surrounded by the books he loves so much. This interesting take on Red Riding Hood / the Big Bad Wolf is superbly written and deliciously illustrated. Even though he's 'a big stinky wolf' (Charlotte's words, not mine), you can't help but feel sympathy for the poor wolfy chap. Luckily things work out alright in the end. Julia Donaldson and Axel Scheffler can do no wrong with children's books, and Room on the Broom sees the 'Gruffalo' team back in action, tackling another beloved subject dear to children's hearts - witches. Put it this way, if you're creating a children's book for the first time you could do no worse than pick witches as the subject. So for experienced folk like Donaldson and Scheffler, it's money for jam detailing the story of a warty old witch and her bulging broom. Picking up stray characters as she travels the night sky, the witch's broom suffers a slight setback. But all is not lost, witches know a thing or two about spells and brooms so this tale has a nice happy ending. For some reason, Charlotte didn't immediately identify with the nameless witch in this story as readily as she does with Meg (of Meg and Mog fame) or the peerless Winnie, but she rather liked the animal characters and of course the hint of danger midway through the story (which I won't spoil). An instant classic to rack up alongside the rest of your Donaldson and Scheffler collection. Daddy's favourite bit: The rather large spot on the end of the witch's nose. She must use the same face cream as the Gruffalo!